Clean grounds are essential for the success of any business. In one poll, 14 percent of respondents stated that they would stop visiting a retail store if it didn’t meet their standards of cleanliness and another 29 percent said they would only visit an unclean store if they absolutely had to. Quite simply, you may not get a second chance to impress customers or clients if your organization doesn’t provide a high standard of cleanliness. In some industries, cleanliness can be especially important. Restaurant diners, for example, ranked cleanliness of restaurants interiors as among their top ten concerns in at least one poll. In another survey, 70 percent of the diners polled said they wouldn’t return to a restaurant if they noticed unclean restrooms or floors. In addition to proving to your customers that you care about cleanliness, spotless grounds help reduce the likelihood that an employee will be injured on the job. Cleanliness can help prevent slip and fall accidents and other injuries while also creating the best first impression of your business. It can even help improve worker satisfaction and productivity at work. One study found that a clean workplace saw a five percent gain in productivity in a 100-employee office, marking a productivity gain of about 125 thousand dollars. Industrial-grade walk-behind and ride-on sweepers ensure that the floors of your facilities and outside grounds remain free of dirt, dust, debris and other clutter. But like any other piece of equipment, floor sweepers need to be serviced to make sure they are operating at optimal levels. Otherwise, you’re stuck with inefficient cleaning equipment that forces your janitorial staff to spend considerably more time cleaning your grounds. Machines that aren’t working at optimal levels will prevent your technicians from thoroughly cleaning your floors, or they might stop working altogether and prevent jobs from being completed on time. You might ultimately be forced to buy or rent additional equipment as a result. The good news is that by putting your fleet of floor sweeping equipment on a regular maintenance schedule, you won’t have to worry about your machinery malfunctioning. Instead, you can rest easy knowing your sweepers are in optimal condition at all times. As a result, your cleaning technicians will be more effective at their jobs and conquer more space in less time. Properly maintained sweepers and cleaning equipment may be easier to handle and use, which can also mean higher employee satisfaction. Your cleaning equipment may break down, leading to unclean conditions and the frustration of having to repair the sweepers. Your costs may increase – the cost of emergency repairs and new equipment is costlier than a maintenance schedule. You may have to spend more time fielding complaints from workers about malfunctioning equipment if the sweepers don’t work correctly. Your cleaning staff may be injured if equipment is not kept in good repair. You may face the hassle of having your budget thrown into chaos – it’s harder to plan for unexpected breakdowns of cleaning equipment than for scheduled maintenance. When you regularly service floor sweepers, you’re extending their useful life and making sure they’re working properly. By spending money to service your floor sweepers now, you won’t have to worry about incurring substantial bills down the road when unmaintained equipment inevitably falls into disrepair. Do You Need to Maintain Your Sweepers? In general, you need to service your sweeper or cleaning equipment if you own it. If you use a cleaning service, the company you hire maintains their own equipment. If you lease, read the agreement to find out whether you’re responsible for any maintenance. You need sweeper repair because of poor maintenance. Your business property is not as clean as it used to be because of poor sweeper maintenance. Your team mentions that sweepers are not performing as well as they used to or are handling oddly. The cleaning process takes longer. You have owned your sweepers for months and have not done any maintenance. In these situations, you’ll want to get prompt industrial cleaning equipment service – before your equipment breaks down or someone gets hurt! If you have a sweeper down, you’ll need to get someone in for industrial cleaning equipment repair. However, if things haven’t gotten that bad yet, you can be proactive and possibly prevent a breakdown of your equipment by creating a commercial cleaning equipment service and maintenance plan. Qualified, Experienced Technicians and ProfessionalsThe professionals who show up at your place of business to repair and maintain your sweepers and cleaning equipment should be trained, qualified professionals. They should be familiar with different types of sweepers and need to have the skills to fix and maintain them correctly.If technicians arrive when your business is open, they need to be professional. Unfortunately, rude or loud technicians in your place of work can affect the impressions customers have of your organization – even if the workers are not yours. Familiarity With Your Brand of Sweepers and EquipmentLook for a service company with experience working on the specific make and model of your equipment and sweepers. Minor variances in design can mean a big difference. Measurable ImprovementYou should see less downtime, better handling of your sweepers and better cleaning. Satisfied CustomersLook for a service or company with good referrals. Other customers should be satisfied with the service and the assistance they receive from the company. Familiarity With Your WarrantiesOne of the goals of regular service and maintenance is protecting your warranties. You don’t want your warranties to be invalidated by inadequate service. Make sure the technicians working on your machines understand what the warranties for your sweepers or cleaning equipment entail and are willing and able to complete that maintenance.A good company will go above the level of service required by the warranty so you enjoy optimal cleaning performance. Reliability and ExperienceA service and maintenance company with a long history usually means they have expertise and offer the type of service to keep customers coming back – a great sign.In addition to experience, look for reliability. Service and maintenance professionals should show up as expected and complete the required work in the timeframes you’ve agreed to. The company should honor all agreements you’ve made. An Understanding of Your IndustryThe cleaning requirements for a hospital are very different than the cleaning requirements of a parking lot. Make sure the company servicing your sweepers and cleaning equipment understands the standards of service and cleanliness needed for your industry. A Variety of Service PlansYou may have older machines requiring more frequent, thorough tune-ups and inspections or you may have newer machines requiring only the basic maintenance to keep your warranty valid. You may have one walk-behind sweeper or a very large selection of cleaning equipment. There should be different plans to meet your needs and a quality company will listen to your needs and respond with the appropriate levels of service and maintenance. Attentive Solutions and Professional KnowledgeA quality company will listen to your concerns and knowledge, but will bring their own expertise. Just as you have a deep understanding of your industry, the company you hire should understand commercial cleaning equipment inside and out. You don’t have time to research the correct maintenance for your parking lot sweepers or your scrubbers – the company you hire should have this knowledge and should be able to guide you towards the right level of maintenance.A good service will save you time because they understand the machines you use to keep your business clean. Their professionals should be able to take care of the details so you can focus on running your business. Certification, Insurance and GuaranteesMistakes happen. When they happen during your maintenance or service call, the work should be covered. If a technician is injured on the job or inadvertently causes damage to a machine, those costs shouldn’t come out of your pocket. The work and the professionals should be fully covered by insurance.The work should also be guaranteed or have a warranty of some kind for your peace of mind. Finally, the technicians fixing your cleaning equipment should have the correct certification required by your state. Honesty and IntegrityWhen you let technicians from the service and maintenance company into your place of work to repair your sweepers and cleaning equipment, you should feel you’re in good hands. 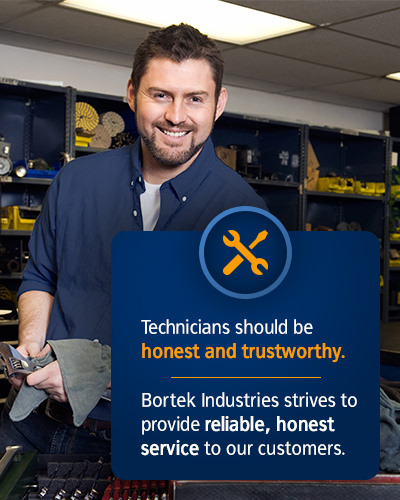 A company should be honest and trustworthy.Bortek Industries, for example, has made it our mission to provide reliable, honest service and we’re happy to say that our customers turn to us when they need service for their scrubbers, sweepers and other equipment. We’re proud to be the principal service for customers across multiple industries. On-the-Spot Minor RepairsWhat happens when a technician finds a problem during a schedule maintenance call? At Bortek Industries, our technicians travel in fully-equipped vans so we can fix problems promptly. That way, you don’t have to worry about missing scheduled cleaning. If we uncover a larger problem, our team is committed to fixing the issue in the timeliest fashion. Repairs for Problems of All SizesIt’s nice if your service technicians can check fluids or adjust the brushes on your scrubber sweepers, but when something major goes wrong with your machines, you want to make sure the company you’ve hired can handle the large jobs as well as the small.At Bortek Industries, we handle everything from squeegee issues to complete rebuilds. We have huge service facilities and a team of technicians capable of handling the jobs other service companies turn down. When you call us, you know we can get the work done.Our technicians can even offer advice, helping you understand the costs of larger jobs so you can decide whether to fix an older piece of equipment or replace it. If you do need to replace an older piece of equipment, Bortek Industries has a range of new and pre-owned swappers, scrubbers and other equipment for you to buy. SweepersWalk-behind and ride-on sweepers will both clean the grounds and the floors of your business, removing debris, dirt and dust. Like all cleaning equipment, these machines are subject to wear and tear, so they need maintenance to perform at their best. Inadequate maintenance results in sweepers getting clogged or not working correctly, meaning you have to rent additional equipment or your staff will need to work harder to maintain your business property.Proper maintenance, on the other hand, means your sweepers are always ready to go and ready to clean your business grounds and floors in the most time-efficient way possible. A proper maintenance schedule by Bortek Industries helps you keep your warranty valid and keeps your property cleaner. Street SweepersStreet sweepers work very hard. In addition to picking up and cleaning away dust and dirt, these machines often have to contend with clutter, litter, sticks, rocks and other larger objects. Street sweepers must work correctly in order to keep debris out of storm drains and to keep streets clean and safe.Because street sweepers work so hard and in a manner similar to other vehicles, they need maintenance – just like your car does. Qualified technicians from Bortek Industries are familiar with all major brands of street sweepers, so we can keep your machines working correctly, helping your team keep streets spotless. Parking Lot SweepersA dirty parking lot can make customers feel as though you don’t care for your business. In some cases, a litter-strewn parking lot can make your customers think your business premises are unsafe. Before your customers ever walk through your front doors, they may be forming an impression of your business – starting the moment they pull into your parking lot and step out of their cars. Parking lot sweepers keep your parking lot clean and debris-free, letting you make the most positive first impression possible.Parking lot sweepers are a considerable investment and proper maintenance helps keep that investment running at peak performance while extending its life. Proper maintenance can even reduce the costs of cleaning, because properly functioning parking lot sweepers don’t require multiple passes over the same area to clean.If you have a parking lot sweeper or a fleet of them, Bortek Industries can work with you to develop the right maintenance schedule for your machines so you get the best results possible. There are no surprises with us – we’ll decide on a schedule and on the guidelines our technicians will follow and we will honor that agreement. You’ll get to enjoy the peace of mind that comes with knowing you’re doing everything you can to protect your parking lot sweepers and property. ScrubbersIndustrial floor scrubbers are essential in keeping floors free from stains and dirt. In some industries – such as food service and health services, for example – floor scrubbers are an essential part of ensuring cleanliness standards are followed. Whether you own a restaurant or a store, industrial scrubbers create a pleasant environment and help prevent slip and fall accidents.To keep your floor clean and safe, you need to reduce downtime and keep your machines running at optimal levels. To do that, you need proper service for your floor scrubbers. A maintenance schedule can ensure that the tires, vacuums, hoses and engines of your floor scrubbers work correctly. A service schedule can also ensure all components of your sweepers are working at their best levels. As a result, your cleaning team can do a better job in a more productive fashion. Sweeper ScrubbersSweeper scrubbers both sweep and scrub floors, giving you the cleanest flooring in the most efficient manner possible. Scrubber sweepers may save you both time and money – but only if they are operating at full capacity. Over time, these machines will work less efficiently. They need proper maintenance to keep them at peak performance.Regularly scheduled maintenance and service will ensure your machines work correctly and your floors stay sparkling. Bortek Industries has technicians who are experts on sweeper scrubbers and our team arrives with all the equipment and information needed to maintain your cleaning equipment correctly. If you’re looking for a floor sweeper machine service, you’ve come to the right place. For more than 40 years, our experienced technicians have helped customers across all industries maintain their fleets of cleaning equipment. We’ll work with you to craft the customized maintenance solutions that make the most sense for your fleet. Together, we’ll determine a servicing schedule that works for your business. And every time your floor sweepers need to be serviced, we’ll make over 50 check and adjustments to make sure everything is working exactly as designed. There’s no sense in buying equipment if you’re not going to spend the necessary money maintaining your investment. By putting your floor sweepers on a regular maintenance schedule, you’re guaranteeing that they will run at peak productivity when your cleaning technicians use them. This extends the useful lives of your equipment and ensures your floors remain spotless. Contact our team today if you have any questions about our floor sweeper service program. We’ll work with you to make sure your machines are properly cared for and your floors are clean.